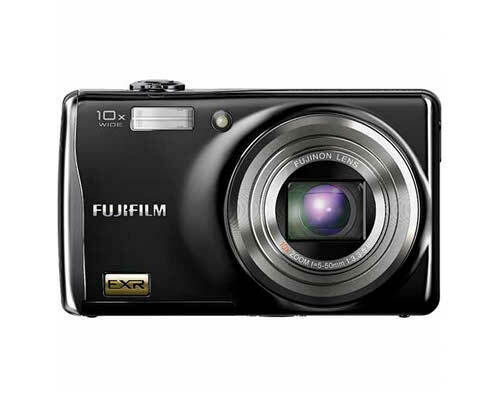 Fujifilm's FinePix F80EXR, introduced in 2010, is a compact megazoom built to be small and inexpensive and succeeds at those two things more than anything else, making it worth considering for the user looking for a small camera with that functionality. The camera measures 3.9" by 2.3" by 1.1" and weighs 6.5 ounces without its accessories, battery or memory card. This makes it fairly consistent with other megazooms that don't use AA batteries in terms of size. The camera captures images using a 12 megapixel 1/2" super CCD EXR sensor. It stores them on SD or SDHC memory cards, or in the camera's 40MB of internal memory, and in JPEG (using Exif 2.2 for compression) for stills, AVI with sound for video, and WAVE for monaural audio. Images can be captured at a number of different resolutions based on aspect ratio. The camera can function at 4,000 x 3,000 (12M), 4,000 x 2,664 (3:2 format), 4,000 x 2,248 (16:9 format), 2,816 x 2,112, 2,816 x 1,864 (3:2 format), 2,816 x 1,584 (16:9 format), 2,048 x 1,536, 2,048 x 1,360 (3:2 format), and 1,920 x 1,080 (16:9 format) pixels. It records movies at a maximum resolution of 1280 by 720 at 24 frames per second and a minimum of 640 by 480 (at 30 frames per second). The camera offers a 10x optical zoom lens with a range between F3.3 (wide) and F5.6 (telephoto) and a focal length between f/5.0 and 50 mm, equivalent to a 35mm camera with a range between 27 and 270mm. The camera's digital zoom goes up to approximately 4.0x and aperture can be set to F3.3 / F9.0 in Wide and F5.6/F16.0 in Telephoto. Its focus distance is between 1.5' and infinity in Wide and 6.6' and infinity in telephoto in Normal mode and between 2" and 8' in wide and 3' and 8.2' in telephoto in Macro. The camera's sensitivity can be set automatically, or to measurements equivalent to ISO 100, 200, 400, 800, 1600, 3200, 6400, or 12800. Exposure control is done via 256-zone metering via TTL. Exposure is available via programmed AE, aperture priority AE, or manually, and the camera offers many shooting modes. Its dial can stop at EXR MODE, Auto, Natural Light & with Flash, Natural Light, Scene Position, Movie, Manual, Program Auto and it offers SP settings of Pro Focus Mode, Pro Low-light Mode, Portrait, Portrait Enhancer, Dog, Cat, Landscape, Sport, Night, Night (Tripod), Fireworks, Sunset, Snow, Beach, Underwater, Party, Flower, and Text. Photography functions include EXR mode, film simulation, face detection, automatic red-eye removal, power management, framing guideline, frame memory, silent mode, and face recognition. The camera's shutter speed moves between 1/4 of a second to 1/2000 seconds in Auto mode and in all other modes between 1/2000 and 8 seconds. Continuous shooting can be done betwee 1.6 frames per second and 4.2 frames per second depending on how the camera is configured. The camera offers autofocus options set to multi, center, or tracking, as well as continuous autofocus and an assist luminator. White balance can be preset to Fine, Shade, Fluorescent light (daylight, warm white, or cool white), Incandescent light, or Custom settings, and its self-timer can be set on a 2-second or 10-second delay. The camera has an automatic flash system with an effective range at ISO 800 of between 1' and 13.8' in Wide and 3' and 7.9' in Telephoto modes. The camera has a 3", 230000 dot TFT color LCD with approximately 100% coverage. It has a USB 2.0 port as well as an HDMI out, which can be toggled between NTSC and PAL when necessary. The camera is powered by a lithium-ion battery (included with the camera) and can be charged with an AC power adapter. The camera's optical zoom can be used when shooting HD movies, but the zoom's movement will be picked up by the camera's microphone when doing so. The camera's EXR modes are limited to 6 megapixels in several instances. Available accessories for this camera include the BC-45W battery charger, a DC coupler, an HD player interface, a waterproof kit, and an O ring kit.